When looking to buy a new vehicle, it is essential to keep in mind what you are looking to get out of it. Are you interested in a sedan, or SUV for everyday practicality? More space for people and cargo might be the first benefit that pops into your mind when it comes to driving an SUV, but they can offer a lot more than added room for drivers and passengers alike. Mississauga residents are invited to read on to learn the benefits of driving a quality SUV from us here at Pfaff BMW. In the past few decades, sport utility vehicles have become a staple to any automotive brand’s lineup, making larger designed cars a popular commodity, and highly sought after. With a rise in popularity, every brand put forth new effort to create expertly engineered SUVs and crossovers for the use of drivers everywhere. For this reason, a substantial influx of makes and models become widely available for purchase, offering more choice and variety than ever before. As SUVs are larger than other classes of automobiles, they boast a higher road clearance and stronger suspension system. When driving along a dirt road, or on a bumpy lane, a smaller car will jostle you about, as every rock and dip can be felt through the suspension, but an SUV will provide you with an all-around smoother ride. This makes off-roading and adventure seeking easy and accessible. BMW SUVs boast versatile handling, providing drivers with one vehicle that can do it all. As a more substantial vehicle, getting behind the wheel of an SUV could provide you with added safety on the road and in case of a collision. Besides the added weight, airbags, and larger body design working to protect you during an accident, the latest models come equipped with superior safety tech for extra protection in the trickiest of situations. BMW models can rely on the driver assistance systems from BMW ConnectedDrive to help maneuver you through tight spots, keep you at a safe distance from traffic, and react with lightning speed in hazardous situations- all to help you feel safe and secure in your new BMW SUV. 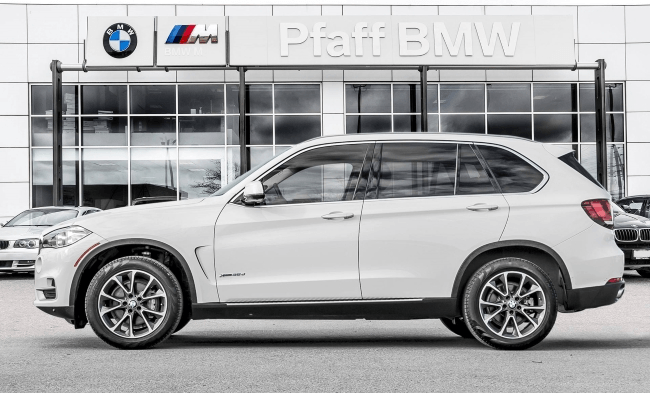 Mississauga residents in the market for a quality made, safe and versatile SUVs should look to us here at Pfaff BMW for all of their driving needs. Visit our local facility at 4505 Dixie Road to test drive our superior lineup today! Please click here to find our contact information, to fill out our contact form for further assistance, or to learn more about our quality sport utility vehicles on offer now.